Regardless of whether one is sympathetic or critical of classical economics, this branch of study is both an historical and logical foundation for further study in economics at large. Before one can understand modern Keynesianism, or give an informed analysis of the trickle down effect, one must first be acquainted with the ideas developed by men like Adam Smith, John Stuart Mill, Carl Menger, Ludwig von Mises, Henry Hazlitt, and F.A. Hayek. This is partially because these ideas historically form the background that later, more collectivist styles of thinking respond to. However, on a more conceptual level classical economics is vital to understand because of its simplicity. These thinkers endorse the free market. They want to limit government intervention and allow nature to run its course. Some say this is benevolent efficiency while others call it nefarious social Darwinism. But either way, this view is a good place to begin one's study of economic theory. Not only is classical economics useful to study for historical and pedagogical purposes, it is also a vibrant intellectual force in today's world. Many of the most prominent think tanks in the world openly expose free market ideas. Groups like the Atlas Network have formed an umbrella organization linking together discussion and research on these topics from every corner of the map. Furthermore, many nations are now moving towards classical economic policies. Old bastions of socialism such as Argentina and the Czech Republic have exchanged their top-down economic policies for bottom-up free market ones. Likewise, the centralized European Union is fracturing as political pressure from things like Brexit, the Five Start Party, and Le Pen's mounting political movement become increasingly critical of Brussels' trade deals and central authority held in the European Union. Thus, classical economics is essential for study both in its former bastions of power and in surprising, new locations, as well as for its impact on history and current events. See also: What can I do with an Economics degree? And then of course there are practical concerns. What if you are a business owner, an investor, or just someone who wants to plan for retirement? A working knowledge of economic theory is useful when trying to navigate the convoluted menagerie that is international finance. Regardless of whether you are a diplomat interested in political economy, a scholar trying to understand social philosophy, or a regular person just trying to figure out how this stuff called money that you spend half your life trying to get actually works, there are many reasons to study classical economics. As such, we at The Best Schools have compiled a list of the top 50 places to study this subject. You will find great diversity among these names. Some are world renowned graduate departments in economics that employ Nobel Prize winning economists. Others are undergraduate programs where a person can build a solid understanding of the subject. Still others are business schools, and many are influential think tanks known for producing large volumes of information but lacking formal degrees. Which program best fits your needs is a personal decision, but all of the entries on this list will equip you with rigorous training in the field of classical economics. One might suspect the leading entry on this list to be an American institution. For many years America was uniquely associated with classical economics, but the world is changing. As time has passed, the west has become increasingly comfortable with left-leaning governments, while Latin America has pushed towards the right. And no school has more enthusiastically spearheaded this change then the Universidad Francisco Marroquin in Guatemala City. Founded in 1971 by Manuel F. Ayau, the Universidad teaches all subjects, from Don Quijote literature to the School of Film and Visual Media, from a free market perspective. The mission of the school encompasses the heart of the free market society with its dedication to "teach and disseminate the ethical, legal, and economic principles of a society of free and responsible persons." The more than 2,700 enrolled students have access to the Ludwig von Mises Library, the Hayek Auditorium, and the Friedman Auditorium. In fact, four of the most notable free market thinkers and Nobel Laureates, Friedrich Hayek, Milton Friedman, James Buchanan, and Vernon Smith, all hold honorary degrees from the Universidad. Students and faculty have honored Mises throughout the years with the annual celebration of his birthday, September 29th, held as a special event with music, dancing, and theatrical presentations. Also held annually at the Universidad is the Antigua Forum. This two day intensive workshop invites worldwide experts to meet and discuss current economic projects holding to the free market perspective. Finally, the school also publishes an online quarterly newsletter titled "UFM Market Trends" as the "21st century equivalent of Friedrich Hayek's business cycle monitor applied to modern markets." During the 1960's the vast majority of economics departments in the United States leaned left. To this day a general left-leaning consensus remains, but it is far easier to find professors sympathetic to free markets and classical liberalism than ever before. The reason for this dramatic thawing of the barriers to classical thinking in the university largely comes from University of Chicago professor Milton Friedman. Friedman, and the others whom he inspired and collaborated with, are credited with creating the Chicago School of economic thinking and the fresh water school of macroeconomics, (as opposed to the salt water school historically espoused by places like Harvard, MIT, and Berkeley). They operated within an almost entirely hostile intellectual climate, and nevertheless carved out a space for themselves at the intellectual table. The Chicago School has gone on to be one of the most important in recent economic history, and University of Chicago scholars have won numerous Noble Prizes. Those interested in studying this tradition will benefit from doing so in the midst of where the modern revival began. Also, irrespective of what perspective one favors or is even interested in, no one can deny Chicago's academic prestige, for it is one of the most respected programs in one of the most well-known universities in the world. The Atlas Economic Research Foundation, and the Atlas Network that it produced, has become the think tank of think tanks. It was started in 1981 by Antony Fisher. Fisher was forever changed after reading F.A. Hayek's The Road to Serfdom. Fisher was so moved by it that he sought out Hayek, who was then teaching at the London School of Economics, and decided to take Hayek's ideas into politics. Eventually, Fisher came to believe that the most effective way for him to produce change was to encourage an intellectual revolution. The work he did laid the foundation not just for the Atlas Economic Research Foundation, but for numerous other spin-off think tanks. But perhaps more important than this was how his work laid the intellectual foundations for Margaret Thatcher and Ronald Reagan. Today, the Atlas Network connects over 450 different think tanks in almost 100 countries. If you want to get involved in the freedom movement and how it relates to your nation, join a local think tank. But if you want to be at the front lines of classical economics across the world you need to go through the Atlas Network, which unites classical liberals from every corner of the map. Ludwig von Mises has been called the last knight of Liberalism due to his staunch defense of classical liberal thinking both in economics and social theory. Mises was one of the great libertarian scholars of the 20th century, and had both a profound impact and a close friendship with Mises Institute co-founder Murray Rothbard. The institute now promotes both men's work, as well as numerous other classical liberals. Congressman and three time presidential candidate Ron Paul, as well as his son senator Rand Paul, are both intertwined with the organization. Tom Woods and Robert P. Murphy of the popular Contra Krugman podcast are also affliated with the Mises Institute, as well as renowned anarchocapitalist Walter Block. TV host and New Jersey judge Andrew Napolitano also regularly interviews Mises scholars and partakes in their programs. The institute runs a publishing company, distributes periodicals, supports visiting scholars, and puts on multiple seminars including their annual Mises University. The program also offers numerous online courses and free educational material. The institute is located in Auburn, Alabama, across the street from Auburn University. It can consequently draw from resources provided by its much larger neighbor. George Mason University is Virginia's largest public research university. It consists of 10 schools and colleges that service 34,000 students. Its economics department's tradition was largely shaped by two famous scholars. James Buchanan, who still serves as professor emeritus, helped develop the school's focus on Public Choice theory, while professor emeritus Vernon Smith advanced the school's love of Austrian economics and experimental economics. These two extremely respected Noble Prize winning economists have helped shaped George Mason's connection to classical economics. George Mason's program also stresses the connection between free markets and peaceful prosperity. The school offers undergraduate through doctoral studies, and maintains the Interdisciplinary Center for Economic Science, or ICES. ICES is internationally recognized as a leader in research on economic, social, and market behavior. It brings together a diverse collection of scholars from economics, computer science, law, engineering, and neuroscience. The school also runs The Center for Study of Public Choice, which supports students studying Virginia Political Economy and runs two public choice seminars a week. Being in Virginia, the school is also near Washington D.C., which connects it to a whole host of think tanks, political offices, and numerous other opportunities. Professor Peter Boettke edits The Review of Austrian Economics. The school also has well known sister programs in fields like public choice theory and the history of thought. The Instituto Libertad y Democracia in Peru is a specialized free market think tank. Many places that focus on classical economics do so with either an educational emphasis, such as the Mises Institute, or a political focus, such as the American Heritage Foundation. But this organization instead emphasizes the need to advance property rights throughout the developing world. The organization was founded by Hernando de Soto, one of the world's leading Latin American economists and a successful entrepreneur, in 1979. Soto envisioned a world where people outside the first world had access to the business rights which allow for participation in the formal economy. He believes these first legal steps are critical in building a healthy business environment. No less than 35 heads of state have sought after this institute's advice. The organization also runs high profile projects such as initiating land titling in El Salvador, simplifying legal codes in Tanzania and Egypt, and managing property formalization in Peru. Soto has not just changed the economy in his native Peru, but also enacted change across the globe (especially in the developing world), and the institute will carry on his work well into the future. The Mercatus Center at George Mason University was founded in 1980 by Rich Fink as a not-for-profit organization. It is substantial enough to warrant considering its contribution to classical economics on its own. Its mission is to generate the knowledge to prosper and "overcome the barriers preventing individuals from living free, prosperous, and peaceful lives." The name itself infers its free market leanings, as "mercatus" is the Latin word for "market". Their stated goal is to, "bridge the gap between academic research and public policy problems." It intentionally draws on the ideas of Nobel Prize winners such as Friedrich A. Hayek, Elinor Ostrom, Douglass North, and George Mason University's own famous professors James Buchanan and Vernon Smith. It does so while conducting research on topics such as the Study of American Capitalism, the Technology Policy Project, the Spending and Budget Initiative, and the Financial Markets Working Group. The institute has become extremely influential. For example, 14 of the 23 items that the Bush administration listed as rules to remove came from Mercatus policy proposals. And of course, working in close conjunction with an economics department as unashamedly connected to classical economics as George Mason's gives this place the full resources of a research university. The Foundation for Economic Education, or FEE, was founded in 1946 as a non-profit by Leonard E. Read, who served as the organization's president until his death in 1983. As its name implies, FEE's vision was more educational than political. FEE has served as an epicenter of libertarian thinking since its inception. It operates out of Atlanta, Georgia, and is the oldest free-market think tank in America. It had a profound impact on several of the 20th century's chief classical liberals. Murray Rothbard was deeply influenced by Baldy Harper, a FEE economist, and said FEE created a, "crucial open center" for libertarianism. Likewise, Hayek felt indebted to the organization. FEE has attracted such illustrious speakers as Ludwig von Mises, Henry Hazlitt, Milton Friedman, James M. Buchanan, Vernon Smith, Walter Williams, F.A. Hayek, and William F. Buckley, Jr. The organization is currently run by Lawrence W. Reed. FEE exposes a broad perspective that transcends politics. It sees itself as defending the principles of a free society in law and ethics just as much as economics, and holds that ultimately these principles are all interdependent. The organization offers free online courses, up-to-date content, and various other online resources. It is solely supported by donations. After World War II the values that sustained western civilization were under threat. Twice within one generation, the world had laid aside peaceful production and instead sowed the ground with the blood of their neighbors, and even as the world recovered, the new, centralized threat of communism was growing in the east. Against this backdrop F.A. Hayek created the Mont Pelerin Society in 1947. The society began as 36 intellectuals gathered in Switzerland to discuss the future of classical liberalism. Most of those present were economists, although historians and philosophers also joined the distinguished company. Figures like Ludwig von Mises, Milton Friedman, and Karl Popper shared their thoughts on the new challenges before the world, and the need to provide an intellectually vigorous response. For those wishing to study classical economics there is perhaps no more prestigious and exclusive route to take. One can only attend a Mont Pelerin Society meeting if he has been invited by a member, and one can only apply to join if he has already attended a meeting. But, if you can acquire access you will be rubbing shoulders with those on the forefront of classical liberal thought, whose number includes Noble Prize Winners. The Mont Pelerin Society does not offer degrees nor courses; just a medium where the best in the business can enlighten each other. The Czech Republic is like many eastern European countries. After living under the iron curtain for decades it has taken a hard pivot towards the right. It is now in various ways far friendlier towards the free market than its western kin within Europe. Much of the activity coming out of this classical liberal movement traces its origins back to the University of Economics in Prague. This is the leading economics and business school in the nation, with roughly 20,000 students all studying a field relevant to money. Obviously, this gives students ample resources and networking opportunities. The school has also heavily invested in research and currently runs 10 different research centers. But perhaps the most impressive thing about the University of Economics is the close relationship its shares with its national government. Many of the officials in the Czech government teach at the school annually, giving students direct access to people who can put economic principles into action. Thus, this university is arguably the best place to study classical economics in Europe, and certainly the most respected place to do so in the Czech Republic. New York City is the financial hub of the world. Every major financial market follows what goes on in Wall Street, and keeps a spare eye on the political momentum flowing back and forth in the United Nations. Oh, and let's not forget that the Federal Reserves' most influential regional bank is based out of New York. Consequently, the Big Apple is a great place to study economics if for no other reason than so many important decisions are made there. Thus, the location by itself would attract students to New York University. However, NYU has a lot more going for it than just a great location. Founded in 1831, the 50,000 thousand student school now stands as one of the biggest private universities in America. NYU also has campuses in Abu Dhabi and Shanghai. The economics department in particular came into its own during the 1990's and early 2000's. The school now boasts twelve fellows of the Econometric Society, a National Academy of Sciences member, two Nemmers Prizes, and a Nobel Prize winner. The department also runs numerous well known centers. The Austrian Economics Program is of particular interest to those studying classical economics. With scholars like Israel Kirzner, David Harper, and Mario Rizzo at the helm, students have many opportunities to do research in the field. For instance, the department runs a weekly Austrian Economics Colloquium and an annual summer course. This program has been in operation since Mises taught at the school. Founded in 1876, Grove City College is one of the premier conservative colleges in America, and arguably the best destination for home schoolers. Grove City is a non-denominational Christian school that does not require students to sign a statement of faith. Thus, it has a Christian character but does not require an exclusively Christian student body. Overall the leanings of most faculty are conservative, and shaped by limited government values. The school's economics department offers a bachelor of arts in economics, a bachelor of science in business economics, or a minor. Many of the school's faculty are represented among the numerous think tanks mentioned on this list. Grove City is particularly known for its strong commitment to Austrian economics. Economics professors include Mark W. Hendrickson, Shawn R. Ritenour, and department chair Jeffrey M. Herbener. Dr. Herbener is heavily involved with the Mises Institute, and even delivered the Ludwig Von Mises Memorial Lecture titled, "Time and the Theory of Cost," during the 2016 Austrian Economics Research Conference. The school is also well known for its strong representation in law and the humanities, and has a much respected reputation in the sciences. Any economics graduate of Grove City is well positioned to carry classical economics into either the business world or into the pursuit of further academic studies. The Cato Institute is a libertarian think tank located in Washington D.C. The school was initially called the Charles Koch Foundation when Ed Crane, Murray Rothbard, and Charles Koch founded it in 1974. The institute has since become a substantial policy research center with almost 50 full time faculty, 70 adjunct faculty, and 100 staff. Its slogan of, "Individual Liberty, Free Markets, and Peace," aptly summarizes its stance. The Cato Institute publishes a wide array of materials which include briefings, periodicals, policy studies, books, and peer-reviewed academic journals such as the Cato Journal and Regulation. No less than ten Noble Prize winners have worked with Cato. The institute also gives the Friedman award every two years. Cato runs several noteworthy websites such as Libertarianism.org, Cato-unbound.org, Overlawyered.com, and Policemisconduct.net. These publications and websites disseminate the dense material of their small army of astute scholars in a way that is both accessible to the public, relevant to public policy decision making, and capable of advancing academic discourse. Given its enormous size and scope, many consider Cato to be the world's most influential libertarian think tank. Certainly, the institute sits at the center of the classical economic world. There are many places to study classical economics, and there are many places to study theology, but few make a concerted effort to wed the two. Founded in 1990, the Acton Institute represents a synthesis between the spiritual commitments of Roman Catholicism and the liberty of the free market. Obviously, the emphasis at Acton is different from the other entries on this list. Those studying at the Acton Institute will read traditional thinkers, from Adam Smith to more recent minds like Henry Hazlitt, but they will also study Christian social theory. Acton has a particular affinity for Dutch Neo-Calvinist Abraham Kuyper, whose sphere sovereignty, although not libertarian per se, does endorse a limited government perspective. Conservative Roman Catholics and Protestants will find Acton's unique take on economics enlightening. Acton helps Christian's round out their world view in a holistic way. Those outside theological circles may still find Acton interesting, and the work of its scholars fruitful. The institute runs a number of conferences, including a summer seminar. They also run a publishing house and make a concerted effort to bring their ideas into the international arena, (they produce material in eight different languages). It is also known for its "Faith and Freedom Award," who's past recipients include Margaret Thatcher. Clemson University is one of America's most selective public research universities. As such, it has many of the advantages of an elite private school combined with the size and resources of a large public school. Founded in 1889, the university has grown to include seven colleges and services over 22,000 students studying over 80 majors. Among these fields of interest is the John E. Walker Department of Economics. Well known faculty members include Scott L. Baier, Howard Bodenhorn, and William R. Dougan. The department self-consciously follows Milton Friedman's assessment of the Chicago School, which was to "reject both theory without evidence and evidence without theory." The department has 25 full time faculty and over 60 PhD students. Students who are earlier in their career can apply 12 credits from their bachelor's degree to their master's program. A notable example of a Clemson economist who is sympathetic to classical views and running research is Dr. Thomas Hazlett, who directs the school's Information Economy Project. Beloit College in Wisconsin is a private, liberal arts college founded in 1846. It has a small undergraduate population of roughly 1,300 students. Thus, Beloit is a place to acquire a strong undergraduate-level training in economics that is open to classical interpretations. Here students with an interest in economics have three options to choose from. This includes a degree in Economics, which is designed for students with an interest in further academic studies and often coupled with study in math, a degree in International Political Economy, which combines the rules from political science with economic theory, and Business Economics, which combines the pragmatic world with the theoretical. Speaking of the pragmatic, in 1985 three Beloit College students created Belmark Associates, which is a student run Market Research group that gives students the sort of training that will prove useful in either business or think tank related study. Students interested in classical economics will particularly benefit from George Mason University graduate and Professor Laura E. Grube, who has done research with the Free Market Foundation in Johannesburg, South Africa. Hillsdale College may be the most conservative college in the country. It prides itself on being what college was supposed to be. The school requires all students to take the same 15 course core curriculum that instructs students in founding American principles. These limited government principles are put into action at Hillsdale College. The school receives no financial assistance from the government since a dispute over affirmative action in 1984. The school is run by Larry P. Arnn, who also serves as a trustee of the American Heritage Foundation. Hillsdale College is a small liberal arts college. Consequently, it does not have the resources to fund a massive economics department, nor does it have the international clout necessary to attract Noble Prize winners. However, it does teach from a strict, classical liberal perspective that is vital to the development of free market thinking. All students at Hillsdale are required to sign a statement of self-governance, and expected to become self-sufficient thinkers and citizens. The school was also the first in America to adopt an official policy of nondiscrimination based on gender, race, or national origin. Do not expect Hillsdale bachelor-bearing grads to immediately go work in the White House or on Wall Street. However, one can expect them to take their commitment to classical education and independent ideals to their next stage in life, and consequently Hillsdale is a great school to lay the foundation for future work in classical economics. The American Heritage Foundation probably has more influence over the Republican Party and conservativism (broadly defined), at large than any other think tank. While founded in 1973, the organization produced the "Mandate for Leadership," which in many ways provided the backbone for Ronald Reagan's administration and catapulted the organization into the epi center of the right wing political world. The foundation is connected to many extremely prominent figures in the conservative world. For instance, its board of trustees includes president of Hillsdale College Larry P. Arnn, former senator Jim DeMint, and president and CEO of Forbes, Steve Forbes. Heritage also partners with the Wall Street Journal when they publish their Annual Index of Economic Freedom. They chart the annual expansion of federal spending, revenue, debt and deficits, and entitlement programs in the Budget Chart Book. This book is made free for the public. The organization has a nearly 100 million dollar annual revenue and is located in Washington, D.C. Given this extensive array of connections, the American Heritage Foundation is not just a place to study or develop free market ideas, it is also where one goes to put these ideas into action on Capitol Hill. The Hoover Institution began as a library founded by Herbert Hoover in 1919. After he became president, the Institution rapidly grew in prominence. Now the Institution is ranked number 19 according to the Global Think Tank Index. It has become a common destination for former political figures including Michael Boskin, Edward Lazear, John B. Taylor, John Cogan, George Shultz, Edwin Meese, Amy Zegart, and Condoleezza Rice. The Institution is located on Stanford University's Campus and is part of the university, despite retaining some autonomy. It is well funded with a roughly 70 million dollar endowment which gives it plenty of resources to direct towards research and public outreach. Hoover's disposition is generally conservative. It runs the Hoover Institution Press which publishes many books written by its fellows. It also produces four quarterly periodicals. Many interested in classical economics may have heard of Hoover through the staunch libertarian economist Thomas Sowell, who has published over 30 books from a free market, libertarian perspective. Hoover has been particularly supportive of Milton Friedman and F.A. Hayek's work. It provides online access to both thinkers' writings, as well as several other likeminded thinkers, through The Online Archive of California. Loyola University in New Orleans is one of the premier Jesuit schools in the United States. It services roughly 5,000 students with an endowment of approximately 270 million dollars. Thus, it is large enough to draw on university resources while maintaining the intimacy of a smaller school. Its College of Business runs several major centers. These include the Center for Entrepreneurship and Community Development, which helps build bridges between economic institutions and their surroundings. The college also runs the Center for Spiritual Capital, which is a home for leaders in entrepreneurship who are involved in business, academics, religion, and politics, and attempts to further ethical dialogue. Furthermore, Loyola runs the Carlos M. Ayala Stock Trading Room for students looking to learn the ins and outs of day trading, and the Executive Mentor Program which matches students with business executives from the New Orleans area. These centers equip students with many avenues by which they can apply their knowledge of economics, but for those students with more academic interests in classical economics there are several faculty actively researching free market ideas. These include Daniel D'Amico, William Barnett, and Walter Block. Walter Block in particular has established himself as one of the leading anarchocapitalists of our generation, and one of the successors to Murray Rothbard's legacy. India is the most populous country in the world, with just about 1.4 billion people. It also has an up and coming market economy, but has recently been ravaged by an abrupt transition away from a cash-based financial system under Prime Minister Modi. The Centre for Civil Society in India was started by Parth J. Shah, a man who discovered the work of Ayn Rand in college. After reading Rand, Hayek, and Friedman, he decided to pursue economic study at the University of Auburn in Alabama. He then returned to India and started a pro free market think tank. Now that think tank is actively employing roughly 30 full time staff, 30 interns, and numerous volunteers in an active attempt to bring classical economics to what could become the world's largest economy in another generation. The centre also offers courses which more than 7,000 young people have studied in. They are partnering with other groups through the Atlas Foundation's Global Initiatives to translate free market ideas into Hindi. The centre was also instrumental in the creation of the National Independent Schools Alliance, which is an organization supporting the funding and legal authority of private schools. Suffolk University is located in America's leading city for university education, namely, Boston, Massachusetts. Founded in 1906, it is a private, coeducational, nonsectarian school with over 8,000 students. The Economics Department offers degrees in Economics or International Economics. Also, the Suffolk's Sawyer Business School offers a program in Business Economics that combines both practical application and theoretical underpinnings. The school caters to nontraditional students by offering part time, evening, and weekend courses. In 1991 the school founded Beacon Hill Institute at Suffolk University, which is now the research branch of the Economics Department. The Institute advocates an uncompromising application of free market principles. For instance, they were critical of both Hillary Clinton's left-leaning welfare programs and Donald Trump's tariffs throughout the 2016 presidential campaign. Students at Suffolk University get the best of both worlds. They receive the instruction that professors provide, yet also the research opportunities that stem from think tanks. Established in 1848, Rhodes College is located in the culturally rich area of Memphis, Tennessee. Today Rhodes College is comprised of 18 academic departments and 13 interdisciplinary programs with nearly 2,000 students in attendance. The more than 50 available majors, minors, and other programs have all been accredited by the Southern Association of Colleges and Schools. The department prides itself on being able to offer scholarships for the international study of economics. It also offers the Morelle Legg International Internship for Women, which is a scholarship awarded every one to two years to a woman in her junior year of study. Other international scholarships include the Theodore William Eckels International Business Internship, and the Wafsky Iskander International Internship. The Manhattan Institute for Policy Research was created in 1977 in New York City as the International Center for Economic Policy Studies. Its name was changed in 1981. The organization is on a mission to "develop and disseminate new ideas that foster greater economic choice and individual responsibility." The institute divides its efforts into several divisions, which include the Center for the American University, Center for State and Local Leadership, Center for Legal Policy, Center for Medical Progress, Center for Energy Policy and the Environment, and Economics 21. Despite the Institute's right leanings it still has worked with those across the political divide. For instance, after 9/11 when the New York police department asked the institute to develop counterterrorism strategies the institute partnered with then democratic mayor of Newark Cory Booker, (now senator), to introduce prisoner reentry principles that connected ex-offenders with jobs at the time of release. In 1990 Manhattan founded its own magazine called City Journal. Several influential books produced by institute affiliates include Charles Murray's Losing Ground, Peter Huber and Mark Mills' The Bottomless Well, and Edward Glaeser's Triumph of the City. The Manhattan Institute developed the Adam Smith Society, which is a free market organization based at business school campuses. They also run projects such as their Social Entrepreneurship Initiative and their ObamaCare Impact Map. The University of Canterbury is one of the leading schools in New Zealand. With a student population of about 15,000 and a history dating back to 1873, this school has established itself. According to the Academic Rankings of World Universities, Canterbury is among the top 400 universities in the world. Canterbury offers several variations of master's degrees which budding classical economists should find interesting. These include a master's of commerce in finance, a masters of commerce in economics, and both a master's of arts and a master's of science option. These are relatively brief, 12 month degrees that allow students to study commerce from a free market friendly perspective amidst the natural beauty of a place like New Zealand. This should be particularly attractive to students from Europe and America who can take advantage of the exchange rate to acquire a low cost degree and international experience while doing research relevant to classical economics. The school also offers a doctorate in economics and finance for students interested in writing a dissertation. The University of Canterbury is listed by the Mises Institute as a good place to study Austrian economics. The University of Guelph is a major research institute for higher education located in Canada. It has roughly 28,000 students and an ample endowment, which puts its graduates in a good place to pursue further academic study or prestigious careers. It was ranked 5th in Canada in 2016 according to Mclean's University Rankings. Guelph formally established the College of Business and Economics in 2006. The department of Economics and Finance is housed under this college, although Guelph has been teaching economics since 1966. The department proudly holds to the Principles for Responsible Management Education throughout the curriculum. The 27 faculty members of the department are not only field experienced and experts in the classroom, but are also involved in the Business Career Development Center. This facility provides additional resources to students studying economics including workshops, mentoring, networking opportunities, and one-on-one career coaching. Also affiliated with the economics department is the Center for Business and Student Enterprise which helps students connect to local business, making the theories of the classroom come to life. Turkey is a nation lying in the world's crossroads. It is both a member of NATO and a Muslim nation. It is both European and Middle Eastern. And, it has been pulled in both progressive and traditionalist directions. Thus, the Association for Liberal Thinking in Turkey is one of the most important think tanks of its kind. The group was created at the end of 1992 by Turkish intellectuals and officially recognized in 1994. In 1997 it began producing its flagship publication, the Liberal Düşünce (Liberal Thought). The association is based out of Ankara, the Turkish capital. The organization has over 200 people working for it, runs numerous conferences, an annual writing contest, and special projects. For instance, in 2004 it ran the "Inter-religious Affairs: Search for a Peaceful Coexistence in a Secular and Democratic System" project which was sponsored by the European Commission. At the time of this article's writing, the future of Turkey hangs in the balance, with a move away from classical economics becoming increasingly likely. If that is to change, there is no doubt that the Association for Liberal Thinking will be at the forefront of the intellectual movement. The Libertad y Desarrollo, (LyD), is the leading libertarian think tank in Chile. South America, as a general rule, has historically been one of the most left-leaning regions of the world. Here Marxism and Liberation Theology have deep roots. Nevertheless, Chile is a notable free market counterweight to an otherwise socialist continent (although that trend is reversing as places like Argentina move to the right). Chile has one of the most successful economies in the region, and the average Chilean uses the nation's self-directed retirement system to retire with more savings than the average American. Much of this libertarian activity arises out of LyD, which since 1990 has built the intellectual case for the free market. The organization is divided into several programs which include the Economic Program, Social Program, Society and Politics Program, Legislative Program, Environmental Program, and the Justice Program. Here economists like Hernan Büchi, Luis Larraín, and Cristián Larroulet work to bring classical economics to the forefront of their nation's discussion. The Heartland Institute was founded in 1984 in Chicago. It has become one of the fastest rising think tanks in the U.S. The Heartland Institute has a modest annual budget, (by think tank standards), of roughly five million dollars. Nevertheless, it has become the definitive critic of global warming, and often uses free market economics to critique climate change proposals. This approach is of course controversial. Some proponents of the free market will also endorse typical climate change perspectives, and thus shun the usage of classical economics as a weapon against climate change arguments. Others, however, see climate change arguments as pseudoscience, and look upon the Heartland Institute's work as not just an advancement for the economy, but also for environmentalism. The institute additionally advocates tax reform, especially in the areas of alcohol and tobacco. Heartland points out that although heavy sin taxes on such products can cover immediate revenue shortages, they are not long term solutions and the revenue they produce will quickly decrease. The Heartland Institute also favors constitutional reform from a limited government perspective. 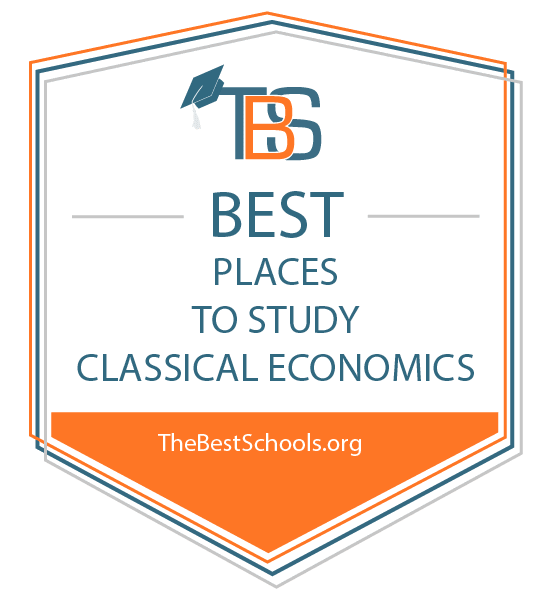 As a whole, this institute's study of classical economics is more specialized than many of the other offerings on this list. Nevertheless, for those with interests which do line up with the Heartland Institute, there may be no better place to study. Hampden-Sydney College in Virginia is unique for several reasons. The school was founded in 1775, making it the oldest private charter college in the south. It is also one of only three four-year, all male liberal arts colleges in the U.S. This unique atmosphere carries over into the school's economic perspective, which provides ample opportunity for free market thinking. The degree program includes three different majors; Economics and Business, General Economics, and Mathematical Economics. The school also offers two distinct tracts; Banking and Finance as well as Entrepreneurship. Typically those with a strong interest in the free market favor the latter option over the former, while those with more centralized views of economics do the opposite. This has led to a Federal Reserve that is largely left leaning. But at Hampden-Sydney one can acquire a healthy respect for classical economics while preparing to enter the banking industry. This gives those with relevant interest a path towards banking that otherwise is often difficult for those bearing laissez-faire sympathies. Claremont Graduate School is a respectable center of learning in its own right. Founded in 1925 and located near Los Angeles, the school has had ample time to prosper and is geographically well-positioned to take advantage of the surrounding cultural milieu. But in addition to its own facilities, the school is also a part of a seven member collection of institutions called The Claremont Colleges, which allows the member schools to pool resources. Its Division of Politics and Economics provides master's and doctoral level education in economics and a master's of science in global commerce and finance. Students can also choose from several joint degrees that allow one to combine training in economics with study in areas like religion, political science, international studies, or business. The division is home to several respected research institutes, including the Center for Neuroeconomics Studies and The Claremont Institute for Economic Policy Studies. Here students have access to deep specialization in both behavioral economics as well as public choice/finance. The school also runs multiple research initiatives studying topics with economic ramifications such as the effects of terrorism on support for democracy and sustainable energy modeling. Claremont has several faculty working out of classical-friendly paradigms. As the school's name implies, the Walsh College of Accountancy and Business Administration specializes in degrees related to business and finance. The school began in 1922 with an emphasis on practical education. To this day, 87 percent of students transfer in from county colleges, which is not surprising considering that most of these students want to get the maximum value out of their education's funding. Given this strong emphasis on good business sense, it is not surprising that Walsh College takes a strong interest in economics and offers both a two year bachelor's and a master's level degree. The entire economics department teaches from a free market perspective. Here students regularly read Smith, Mises, Hayek, Hazlitt, and others. Students leaving Walsh are usually looking to immediately pursue careers in the corporate world. Consequently, those interested in purely academic pursuits may be better served elsewhere. Nevertheless, alumni are equipped with enough free market fundamentals to operate successfully within the dynamic world of business. The American Enterprise Institute is in some ways the most interesting and the most controversial entry in this list. On the one hand, AEI is an historic defender of classical liberalism. It was founded in 1938 as a policy think tank to oppose Roosevelt's New Deal. Many conservatives at that point thought that the administration had stifled business with excess regulation and consequently undermined personal liberty and business. AEI systematically built a case against Roosevelt's left-leaning tendencies, and instead developed a sustained defense of classical liberal economics. However, the institution in recent years has demonstrated a different kind of power. AEI has become one of the chief centers of neo-conservatism. No less than 20 people affiliated with the Bush administration were associated with AEI, making it arguably the world's most powerful think tank at the turn of the century. This change in focus from classical liberalism to neo-conservativism represents a shift in limited government perspectives in economics to interventionist government in foreign policy. Some may find tension between such a group's economic and political stance. Nevertheless, many who hold to limited government views in economics do hold interventionist positions in foreign policy, and there is perhaps no better place to study both subjects side by side and work through the nuanced relation between the two than AEI. With an annual budget pushing 70 million dollars per year, one of the most impressive lists of powerful connections, a steady supply of new material, and an historic heritage, AEI is well positioned to remain at the epicenter of economic discussion for years to come. Based out of Washington, D.C, and founded in 1984, the Competitive Enterprise Institute, (CEI), is a nonprofit, libertarian think tank. It was created by writer Fred L. Smith, Jr., an economist who spent years working both in industry and government and who has now turned his attention to public policy advocacy. The institute publishes scholarly studies, runs media campaigns, and builds coalitions targeted towards specific issues. They work from a limited government perspective, and advance a property rights based approach to environmentalism. They reject global warming alarmism while still advocating for a better relationship between humanity and the earth through their largest program, the Center for Energy and Environment. But unlike many think tanks, CEI does a lot more than scholarship and/or lobbying. CEI is one of the few think tanks which also has a litigation branch. This litigation arm allows the institute to fight for its principles in a direct and public way, such as when it founded and backed two legal cases against the IRS's implementation of ObamaCare. CEI gives the annual Julian L. Simon Memorial Award. They also run the Warren T. Brookes Journalism Fellowship to support journalists interested in free market economics and the environment. The Lithuanian Free Market Institute is a think tank started by six economists in November of 1990 in Vilnius, Lithuania. The think tank is based on Austrian economics and advocates freedom, personal responsibility, and limited government. As a think tank it is actively involved with advancing research, producing policy proposals, publishing relevant literature, hosting conferences and lectures, and generally developing an intellectual climate favorable to the free market. Since 2011 Žilvinas Šilėnas has served as President and Edita Maslauskaitė has been the Vice President. The institute is known for its Economics in 31 Hours curriculum, which was designed as an interactive teacher's textbook for students between 9th and 10th grade. The institute was given the $100,000 2016 Templeton Freedom award for the material, which is now publically available. It won the same award in 2014 for its Municipal Performance Index. The group also partners with the Atlas Network in promoting the European Academy for Intellectual Entrepreneurs. The institute houses a library and provides a free e-library. Argentina has been known as both a bastion of socialism and one of the most unstable economies in the world for the last century. Despite being the seventh largest country in the world and having access to an extremely varied growing season, the nation has struggled. It even suffered a full-fledged hyperinflation and economic collapse at the last turn of the century. Consequently, the nation's recent push towards the political right represents a powerful change in the political fabric of South America. Now, free market principles are taking root in the nation where money use to go to die. ESEADE stands at the forefront of this evolution. The university offers programs ranging from a diploma through a bachelor's, master's, and doctoral degree. The programs often focus on practical areas such as law, business, and advertising. However, they also include more academic pursuits in economics and political science. As Buenos Aires swiftly develops international prominence, the free market friendly perspective of ESEADE will also grow in prominence. Students interested in studying classical economics in a Spanish context can do no better. Founded in 1856, Auburn University is one of the best schools in Alabama and one of the leading schools in the south. The school has more than 22,000 undergraduate students and over 28,000 students total. Its endowment of roughly 650 million dollars leaves the school well financed with research dollars. Auburn economics professor Roger Garrison is a well-known free market enthusiast and author of an advanced macroeconomics text called Time and Money. The school offers degrees ranging from undergrad through master's and a PhD in applied economics. Auburn proponents of free market solutions will benefit from the Mises Institute, which is located across the street from the school. For years, Leland Yeager served as Ludwig von Mises Professor of Economics at Auburn, which further strengthened ties between the school and the institute. Students consequently benefit from a major research university, yet at the same time enjoy all the unique advantages that a think tank has to offer. West Virginia University is a large state school with over 28,000 students and 353 majors spread throughout 14 schools and colleges. West Virginia founded The College of Business and Economics in 1951 (back then it was called the College of Commerce). It offers six bachelor's, six master's, and two doctoral level degrees. It has one of the largest student bodies of any group mentioned on this list, with over 1,500 undergraduates. The school runs the West Virginia University Student Investment Fund, which gives students hands on experience as it puts them in charge of actually managing real money in the market. In 2014 West Virginia opened the Center for Free Enterprise, which is dedicated to thinking through the responsibilities and privileges associated with working in a free society. It endeavors to put policy makers, entrepreneurs, and scholars in dialogue about how to use the array of economic options that the market grants us. But West Virginia is not just concerned with the ivory tower. They also run the Center for Financial Literacy and Education. This center focuses on equipping everyday people with the knowledge they need to make intelligent choices about their investments and financial future. Students at West Virginia will receive a practical education that enables them to help everyday people or contribute to the highest levels of scholarship. The Reason Foundation was created in 1978. It is a non-profit organization based out of Los Angeles, California, and is well known for publishing its Reason magazine (which predates the organization by ten years). They attempt to advance, "a free society by developing, applying, and promoting libertarian principles, including individual liberty, free markets, and the rule of law." The organization's research is intimately involved with a variety of policy issues including domestic monetary policy, privatization, free trade, and globalization. They run comedian Drew Carey's Reason TV website and are actively involved with the Out of Control Policy blog. Drew Carey is also a member of the Board of Trustees. Robert Poole, one of the Reason Foundation's co-founders, is an engineer with an MIT background and the author of Cutting Back City Hall. This book helped buttress Margaret Thatcher's efforts to privatize in the United Kingdom. David Nott has been the foundation's president since 2001, but before coming to Reason, he spent time at free market capital George Mason University. Much of the activity mentioned on this list is based out of Washington, D.C and New York City. However, Los Angeles is a notoriously liberal city with strong ties to the nation's entertainment industry. Although those who want to be in the midst of political power often go to D.C., and those who want to be near economic power go to New York, the Reason Foundation puts people in the midst of a vibrant cultural epicenter. Ironically, money is often the primary barrier blocking students from studying economics. Yes, learning about how the market works can lead to a prosperous career in business or a prestigious one in academics. But acquiring such an education is expensive and many low cost, distance learning alternatives lack the credibility that our increasingly credentials-driven world craves. Luckily, the Swiss Management Center, (SMC), provides reasonably priced distance education based out of a nation known for its fiscal responsibility. The SMC has been offering numerous degrees since 1985. Students early in their careers can choose a diploma or an accelerated fifteen month bachelor's degree. More advanced students interested in classical economics can pursue one of several doctorates or PhD's, including ones in political economy. The school also has offices in Buenos Aires and Vienna. SMC may be a relatively young school that lacks the connections of New York University or the Mont Pelerin Society, but it is also a school that appeals to students from all walks of life. If you are interested in studying the free market, but are not in a stage in life when you can relocate, the SMC is an excellent option. South Africa is currently the largest economy in Africa, and a member of the BRICs anti-dollar alliance. Thus, they are increasingly becoming a key player on the world stage. Because of this, the Free Market Foundation located in Johannesburg, South Africa will have growing prominence in the years to come. The Free Market Foundation advocates for classical liberalism in various areas, including internet privacy, limited government, rule of law, public choice, education reform, and of course, free markets. The organization divides its efforts into ten different categories. One of its most ambitious ventures is the Khaya Lam (My House) project. This endeavor is attempting to grant 5-7 million dispossessed families title deeds to their homes in an effort to transform lives through private property. The Free Market Foundation also disseminates its information through an active media campaign with public lectures, social media, and a steady stream of articles. The future of the foundation and South Africa's place in the twenty first century remains to be seen, but certainly the success or failure of classical economics in the region will largely rest on this organization's shoulders. When most people hear of the Discovery Institute they think of Intelligent Design. Although it is true that this controversial challenge to materialism and Neo-Darwinian evolution has garnered much attention, the institute is actively involved in numerous issues. One of their chief topics of interest is economics. Discovery runs the Center on Wealth, Poverty, and Morality. This center attempts, "to connect the practical truths of economics with the perennial truths of ethics." Discovery was co-founded by George Gilder, an entrepreneur and economist working from a free market perspective. His famous best seller, Wealth and Poverty, defended supply-side economics and capitalism. The book was published in 1981 and substantially effected the Reagan administration. In fact, Gilder became Reagan's most cited living author. The center covers economics topics as diverse as wealth creation, poverty, free enterprise, faith and economics, stewardship, and politics. It also runs the wealth poverty review. Jay Richards, professor of business and economics at the Catholic University of America and center affiliate, won a John Templeton award for his book, Money, Greed, and God. The institute has also played a pivotal role in promoting technology and its relationship to capitalism, including its advocacy for reform in the Washington State region's public transport. The Institute for Humane Studies was founded in 1961 by Dr. F. A. "Baldy" Harper. Harper was an economics professor at Cornell University who wanted to promote peaceful prosperity and social harmony. He saw greater personal liberty as the path to achieving these goals. During the 1970's, free market economist Murray Rothbard became a key speaker at various Institute for Humane Studies, and used the organization to popularize Austrian Economics. The institute runs seminars, provides over one million dollars worth of scholarships and research grants, and gives mentoring to graduate students and young professors. It also offers education and career programs, and has produced a number of online videos at LearnLiberty.org. They also work alongside of free market giant George Mason University. The Institute for Humane Studies is especially known for its several weekend long studies that it runs every summer for university students on a plethora of topics in the social sciences. The University of Georgia is one of the oldest schools in America. Consequently, it combines the large size and alumni network of a state university with the prestige of an elite private school. The Terry College of Business was founded in 1912 and now offers nine fields of study including economics and finance. Georgia offers bachelor through doctoral level degrees. With over 4,000 students and 94 full time faculty, the business school is large enough to be a college by itself. Students benefit from the Terry Leadership Speaker Series, the Terry Alumni Panel, and the Terry Talk events. Students also have access to hands on opportunities. For instance, undergraduate finance students manage a $250,000 stock portfolio in their Investment Fund Class. Likewise, the alumni sponsored Corsair Society connects undergraduates with recruiting Wall Street firms. With opportunities like these, Georgia students obviously have many chances to jump start a high profile career in the financial world. However, Georgia's size also gives it access to academic minded faculty, including several who are actively interested in classical economics. Georgia is a great option for those interested in a school with both pragmatic and intellectual potential. Santa Clara University is known as the Jesuit school in Silicon Valley. It manages the Leavey School of Business, which is home to the Economics and Accounting departments, as well as numerous other fields of study. In addition to classes and expert study in the field, the 21 faculty members are also involved with the department's newsletter, the SCU Economist. These faculty members include Professor Kris James Mitchener, editor-in-chief of Explorations in Economic History, which has been recognized as the current, "highest impact factor journal in the field of economic history." Additionally, Professor Mitchener was awarded the Markkula Center Grant to "study ethical decision making and reputation in the labor market." Affiliated with Santa Clara is the Civil Society Institute under the direction of Daniel Klein. This interdisciplinary facility holds weekly colloquium, lectures series, and a "coffeehouse" for libertarian ideas. The institute was established in 1999 with the goal of training students in the "classical themes of political economy" and providing a forum by which they could connect these old ideas to modern questions. Being founded in 2015, the Fundación Libertad is by far the youngest entry on this list. Nevertheless, the organization is ideally situated to further accelerate Latin America's transition from a left-leaning bastion of liberation theology to a free market capital. The revolution that Hernando de Soto began is slowly working its way throughout the southern Americas, and this think tank headquartered in San Juan is on a mission to place Puerto Rico among the world's top 10 easiest places to do business, (as listed by the International Monetary Fund). The scholars associated with it are arguing for lower taxes, simplified regulations, smaller government, the Merchant Marine Act, school choice, privatization, and fiscal responsibility. They openly espouse libertarian social theory at large and free market principles in particular. The organization has already become a part of the Atlas Network, is actively producing a steady stream of research, and is integrating Puerto Rico into the larger world of free market ideas. Winston-Salem State University is a historically black public research university affiliated with the University of North Carolina. It was founded by Dr. Simon Green Atkins in 1892 and now provides 40 academic majors and 10 graduate degrees to roughly 6,400 students. About 400 faculty and 800 staff work for the school. Their School of Business and Economics teaches accounting, business administration, economics, finance, management, management information systems, and marketing. Their economics major offers concentrations in international business or banking. Winston-Salem runs a Small Business and Technology Development Center which counsels mid-sized to small business. Several faculty here have a strong interest in classical economics, including Alexander Kondeas, Zagros Madjd-Sadjadi, and the department chair, Craig Richardson. Richardson is an expert on Zimbabwe's economy, which has suffered from one of the worst hyperinflations in history, and works for the Peru-based Instituto Libertad y Democracia founded by famous free market capitalist Hernando de Soto. On a more humorous note, he has poked fun at the scandalously high price of economics textbooks which now commonly run for hundreds of dollars. Anyone interested in studying classical economics will find an open-minded department amenable to free market perspectives at Winston-Salem. As the oldest comprehensive, public institution of higher education on the West Coast, San Jose State University is a part of the 23-campus California State University system. Accredited by the Western Association of Schools and Colleges, San Jose offers 134 bachelor and master level programs with 110 concentrations to choose from. More than 32,000 students are currently in attendance. Of the various schools and colleges which comprise the university, it is the College of Social Sciences which hosts the Department of Economics. Students will find a variety of economics programs taught by field experienced professors leading to a Bachelor of Arts, a Bachelor of Science, or a Master of Arts degree upon graduation. Students are engaged in cutting-edge research through the Undergraduate Honor's Thesis program, the Annual Research Paper Competition, the Biannual Research Proposal Competition, and the Friday Afternoon Workshops. Even high school teachers can benefit from San Jose's economics outreach program through the Center for Economic Education. Troy University began as Troy State Normal School in 1887 under the Alabama State University System. In August of 2005 Troy State University united four campuses to become Troy University. This combining of resources has helped elevate the school from a local state school to an up and coming university. The school now offers degrees in economics at both the undergraduate and master's levels. Their graduate program in economics is run by their Sorrell College of Business. As is to be expected by a degree program intermingled with a business school full of accountants, managers, and administrators, Troy University has a practical emphasis in economics. Students here can take advantage of the Manuel H. Johnson Center for Political Economy. This research and educational center was founded by its namesake, himself a Troy alumni, successful entrepreneur, and public servant. Johnson was troubled by America's unsustainable debt and bloated spending and wanted to do something about it. Thus, he orchestrated the creation of a pro-free market center that taught the moral foundations of capitalism and envisioned the free market as the greatest means by which we can elevate people out of poverty. Students leave the Johnson center equipped with the skills they need to advance this mission. The University of Oklahoma is one of the leading public research centers in the western United States. Its College of Arts and Sciences houses the Department of Economics, which provides undergraduate through doctoral level degrees. The various fields of study offered include Industrial Organization, Economic Development, International Economics, and Public Economics. Students will use The Principles of Economics by Eric Dodge, Cynthia Gamex, and Andres Juaregui as the main text book which attempts to present a balance between classical and Keynesian views. Upper division classes may include engaging topics such as Game Theory, Environmental Economics, and Money and Banking. The department has also recently launched a student run publication titled the Journal of Economics. Both undergraduate and graduate students are encouraged to submit articles for review in the hopes of promoting interdisciplinary research and discussion. In participating with the on-campus publications, students are prepared for the peer-reviewed world of professional, academic economics.